A large keep built by Lady Caranon herself, to serve as a watch-post for Viking raids, but later became the stronghold where she fought her last battle, before it was overrun by the barbarians. This castle has (2) main layers and (1) sub layer. The first layer is where most of the fighting would happen, and where most of the gate houses are. 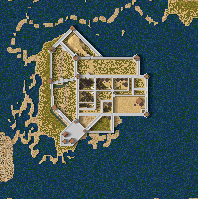 The second layer is where the keep is, and some of the civilian buildings. The sub layer that I mentioned before is a large defense tower that stands next to the front gate, and protects the keep from trebuchet/catapult fire. This map was built to serve as a re-creation of this mighty keep, but I built it in freebuild, so go ahead and tweak it if you'd like, or even turn it into a custom scenario if you'd like. I'm new to this site, so please, rate and comment, so I know how I'm doing on my castles. I really like this castle. The only bad thing i think is that it leans a little farther on the plain eye candy part because if u try to use this map in a real game, u have to delete some walls and move things around to make it functional. I really like it though. I even added it to a skirmish by editing some more stuff. I kept your basic plan though. Hope you don't mind.